A pretty simple set of acrylic nails. White glitter and hearts embedded. And most importantly, the perfect nails to have for a set of nail extension. Long slender nail bed. Ahhh. Nice. 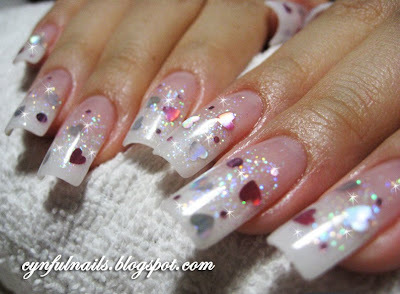 Silver ♥ and pink ♥ hearts. This is something I would love to have on my nails everyday cos it goes well with everything you wear. Wow! You do nails so beautifully! It's amazing.